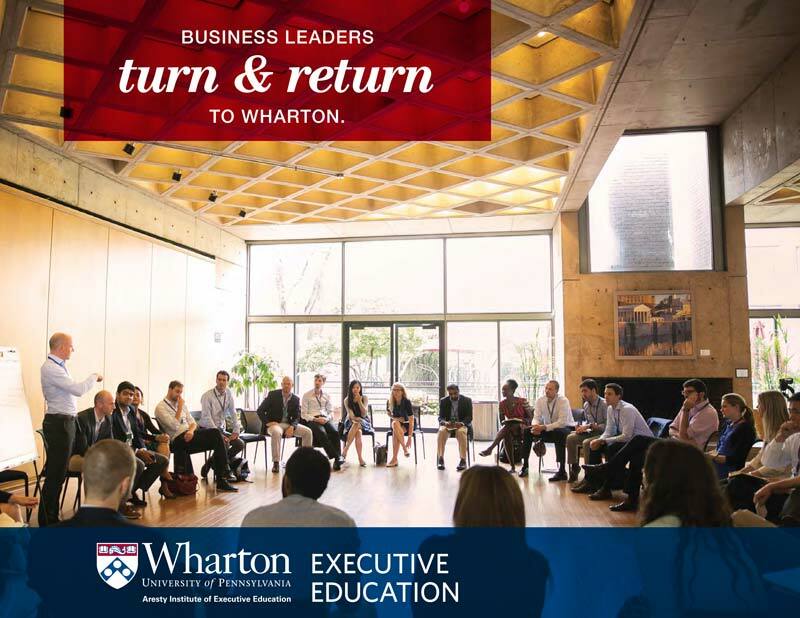 At Wharton, we take leadership to new levels within your organization. We work with your executives to amplify their leadership skills and capabilities, helping them to better lead their teams and achieve your objectives. We develop skill sets necessary to succeed in global markets. We develop world citizens to give your organization an edge when dealing with differences in culture and custom — all while making a positive difference for investors, customers, employees, and communities, regardless of national setting. We take executives out of their comfort zones, figuratively and literally, with experiential learning in external environments. We blend learning methodologies to develop the personal leadership capacities of executives, accruing greater potential for their companies and organizations. 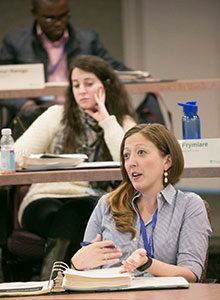 Our Center for Leadership and Change Management, part of Wharton’s McNulty Leadership Program, provides academic research and practical application in the area of leadership development. 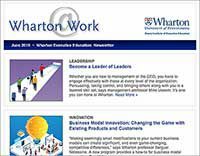 Partnering with Wharton can be a competitive advantage, as we work with your executives to build strategic plans for your organization that work both on paper and in the real world. We bring to bear the full resources of Wharton, led by distinguished faculty and program directors. Together they create an experience for your executives that is meaningful and achieves results. With our faculty building the foundation, we can pull research and inspiration for programming from other divisions of Wharton and the University of Pennsylvania. These resources include, but are not limited to, Wharton’s Center for Leadership and Change Management and the Center for Human Resources. We have partnered with a range of world-class companies and organizations to create transformative executive education experiences. Resulting programs leverage the vast resources, such as the research centers of the Wharton School and the University of Pennsylvania, to showcase powerful thought leadership, and provide solutions that can be implemented immediately. Australian financial services firm the Westpac Group approached Wharton to dramatically improve its managers’ leadership capabilities. The aim was to develop 5,000 world-class leaders who could operationalize Westpac’s 2017 strategy by engaging and achieving high performance from 38,000 employees. To deliver on this commitment, Westpac designed and built a systematic and compelling approach to develop the skills, capabilities, and attributes of its leaders. 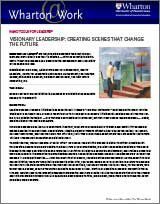 Westpac partnered with Wharton Executive Education and the Australian Graduate School of Management to leverage the thought leadership of each institution in developing the core capabilities needed to realize their strategy. Westpac’s Learning & Development team was honored by the Australian Human Resources Institute with the Wayne Cascio Award for Organizational Development and Leadership. Ensure your next change initiative is a success by envisioning the behaviors needed to implement it. Nano Tools for Leaders® are fast, effective leadership tools that you can learn and start using in less than 15 minutes.